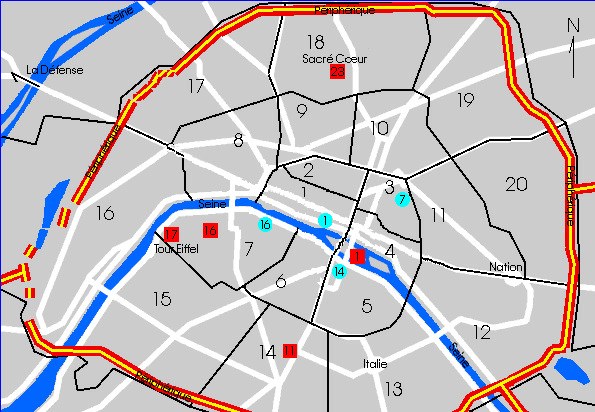 I got up early and walked from blue-circle-14 to the Pablo Picasso museum which is located at blue-circle-7 on the map. Right in the middle of the fashionable Marais district, the Picasso museum is entirely devoted to the great Spanish painter Pablo Ruiz Blasco y Picasso. Hosted in the Hôtel Salé, a city mansion dating to 1656, it was opened in 1985 with 203 paintings and 156 pieces of sculpture. They came from Picasso estate in manner of death taxes paid to the French state. 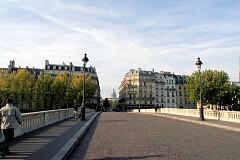 To me, Paris does not seem to be a "morning" city. The Sunday morning streets were deserted - it's about 9:30 a.m. I waited outside the gates of the museum as the workers slowly trudged up, rang the bell, and were admitted. I took this picture of a street sanitation crew coming along to slowly do their work. 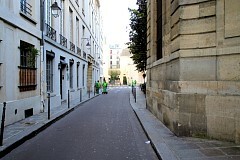 Paris is a very clean city. I liked that the hair and the bald skull are treated separately. 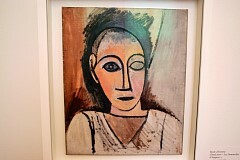 Picasso exhibited a remarkable genius for sculpture, graphics, and ceramics, as well as painting. Pablo Picasso first came to Paris in 1900. With other painters, he then turned Montmartre, a hilly Paris district, into the fabric of modern painting. 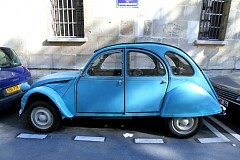 Pablo Picasso spent most of his life in Paris and Provence in the south of France. I was not able to get the name of this painting as I was busted by the museum guard for taking pictures. I hadn't noticed it was forbidden. It's just as well. I expected a lot more from this visit, it seemed to me a great body of the artist's best paintings are not in this gallery. 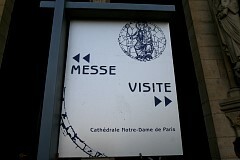 Be your own judge: I cannot recommend this place unless you have seen the other well known art museum's of Paris first. 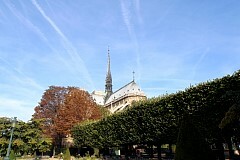 After touring the museum I began my walk back to blue-circle-14 to visit the Cluny museum. 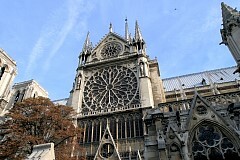 The picture on the left shows Notre Dame approached from behind. The picture on the right shows the dome of the Pantheon in the distance. The Pantheon Paris was originally commissioned as a church in 1744 under Louis XV. However, it wasn't finished until 1789, at which point, because of the Revolution, churches had fallen from popularity. 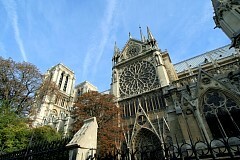 Thus it became a temple to France, honoring historical figures. Within the Pantheon’s ornate walls you'll find a crypt that houses the remains of more than 70 people, including Voltaire, Jean-Jacques Rousseau, Marie Curie, and Alexandre Dumas. It's turned into a nice day with great weather. 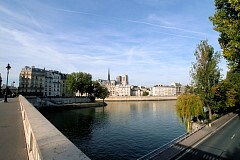 I am passing along the south side of Notre Dame. It's Sunday morning and mass is going on. Tourist may still view the cathedral during mass, just observe where to enter. 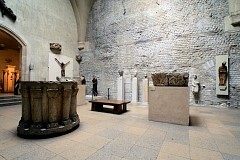 The Cluny Museum of Medieval Artifacts is situated on the location of an ancient Roman thermal bath. The original baths were destroyed in the 3rd century during the barbarian invasions. Eventually, the Cluny Benedictines from the famous Abbey de Cluny in Burgundy bought the land and put up a mansion to house abbots in 1330. 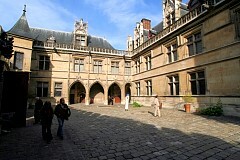 The current structure was built by abbot Jacques d'Amboise during his tenure (1485-1510). 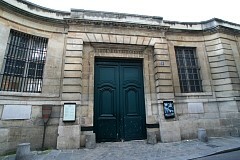 In the 19th century, after having taken some damage during the Revolution, the building was turned into a museum to contain relics of France's medieval past. 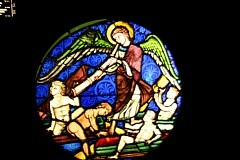 Below are beautiful remnants of stained glass windows from ancient churches. The ancient ruins within the Cluny (look at the back wall) are some of the few real remnants of the Middle Ages left in Paris. 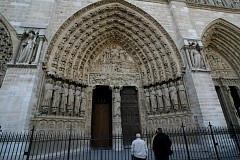 It no longer possesses anything originally connected with the abbey of Cluny. 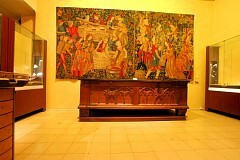 Since its creation in 1843, the museum has displayed numerous pieces of ancient tapestries. 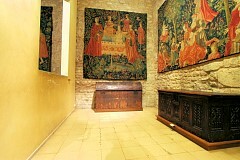 These tapestries, in my opinion, are the signature holdings of the Cluny and an impelling reason to visit one of the somewhat less famous Paris museums. 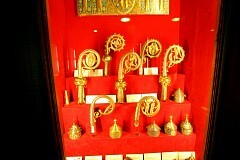 The items in the picture on the right are gold bishop's crosier. The word croisier comes from the French "croisier," meaning one who bears a cross. The earliest examples of the crosier that appear on episcopal seals are extremely simple, looking much like a staff actually used by a shepherd. Gradually the staff became more ornate. The decorations occur chiefly on the curved section, the crook. 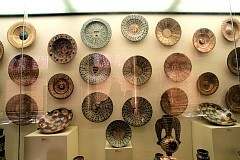 The items on the bottom are elaborate oil stocks, vessels that hold holy oil. 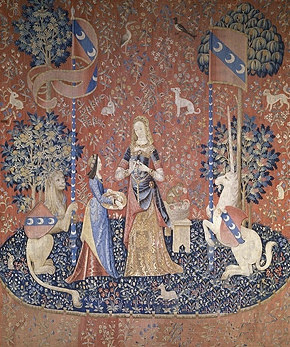 In my opinion, the pièce de résistance of Cluny are the six "Lady and the Unicorn" ("La Dame à la Licorne") tapestries. The designer and weavers of the lady and the Unicorn series are unknown but experts estimate they were woven in the late 15th century. It is thought that the series were commissioned by the Le Viste family, of which the head was Jean Le Viste, a nobleman in the court of King Charles VII, as the coat of arms on the standards, including the lion and the unicorn, represented the family. 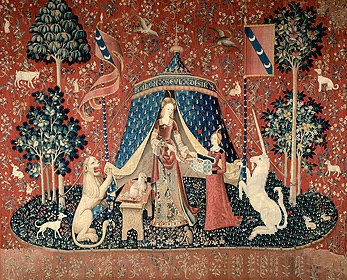 During the Middle Ages tapestries were commonplace amongst the aristocracy, often being used both to add color to drab interiors and provide warmth. 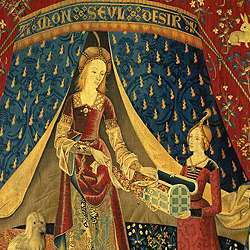 These particular tapestries were undiscovered until 1844 when they were found by French historian Proper Merimee in Boussac Castle. Merimee was the French governments' inspector of historical monuments. 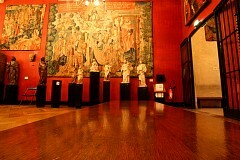 When he discovered the works in very poor condition, he recommended to the government they buy the tapestries. They eventually did in 1882, passing them to the Cluny Museum where they have undergone extensive restoration work over the years which has restored them to their original condition. 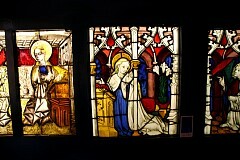 They are kept in the barely-lit windowless cupola of the Cluny Museum to protect them from fading. Consequently, flash photography is not allowed and the pictures I took (just above) had to be taken with exposure priority setting on the camera. Not having a tripod along, the pictures are what they are. Still, you get the sense of what it's like to sit and view the tapestries (benches are provided), which hang in a semicircle. Some interpretations see the tapestries as representing virginity, based on an ancient myth that only a pure virgin could tame the unicorn. 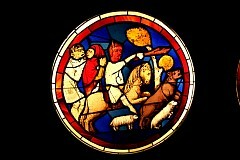 By the Middle Ages Christian Europe had endowed the unicorn with many symbolic qualities, both religious and secular. As well as representing purity and chastity it was often seen as a symbol for Christ. 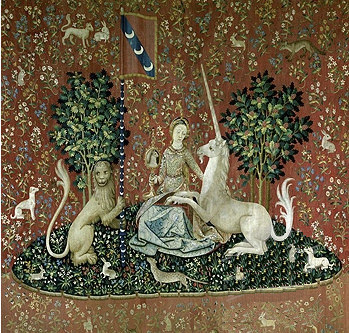 Once accepted into Medieval Europe the unicorn quickly became an important element in art, including tapestries and textiles. Why are all the animals depicted in the tapestries? In the Middle Ages, animal stories were immensely popular throughout Europe. The people of the time were, of course, dependent on wild and domestic animals for their survival, and so had an obvious interest in the animals around them. They could be included simply as "just animals". But the medieval period was also intensely religious. It was commonly believed that the natural world, the so-called "book of nature", had been arranged as it was by God to provide a source of instruction to humanity. This idea was based, at least in part, on biblical verses such as this one from the book of Job: "But ask the animals, and they will teach you, or the birds of the air, and they will tell you; or speak to the earth, and it will teach you, or let the fish of the sea inform you. Which of all these does not know that the hand of the Lord has done this? In his hand is the life of every creature and the breath of all mankind." (Job 12:7-10). Animals were said to have the characteristics they do not merely by accident; God created them with those characteristics to serve as examples for proper conduct and to reinforce the teachings of the Bible. To Christians in the earlier Middle Ages the monkey was a symbol of the Devil, by which was meant heresy and paganism rather than man’s sinfulness. The rabbit was a symbol of fertility and new life. The fox appears as a symbol of the sly, sophisticated devil. Herons were a symbol of righteousness. The lion is noble, brave and fierce, but will only attack if attacked or in great need of food. The goat's love of high mountains represents Christ, who also loves "high things" like the prophets, angels and patriarchs. The weasel signify people who willing hear the seed of the divine word, but then do nothing with what they have heard. The partridge steals eggs and is like the devil, who steals souls from their creator. The lamb is Christ. The dog, a symbol of loyalty and devotion (notice no cats!). The lady takes a delicacy from a dish held by her maidservant. The lady's eyes are on a parakeet on her upheld left hand. The monkey is at her feet, eating one of the candies. You can click on this picture and enlarge it. The resolution is not good, but you can still make out many animals, birds, etc. in the background, including rabbits, dogs, a fox, birds, and either a weasel, ferret or fisher. I think it's interesting that trees are included in all the scenes. Also, the Lady is always much taller and larger than her servant. I also think the device of having the women standing on what appears to be a rug is curious. Note that a dog sits on the train of the lady's dress. The lion is bigger than the servant. The lady stands, making a wreath of flowers. Her maidservant holds a platter for flowers within easy reach. The monkey seated on a bench has a flower, which he is smelling, providing the key to the allegory "smell". A heron is visible, as is also some sort of very specific bird most likely identifiable to contemporaries. Again, the lion and unicorn frame the lady while holding on to the pennants. But these two figures look nothing like the lion and the unicorn in Taste. Could each of the tapestries have been produced by a distinct craftsman, each craftsman creating different styles of the same figures? Seems likely ... The lion is nearly as big as the servant. The lady plays a pump organ on top of a table covered with a Turkish rug. Her maidservant stands to the opposite side and operates the bellows - think of a dresser drawer that you open and close. 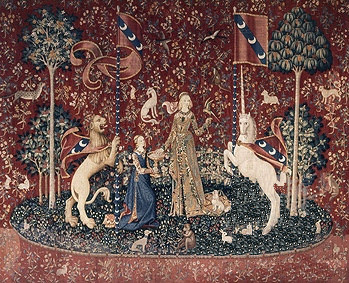 The lion and unicorn once again frame the scene holding up the pennants, but in this scene, their positions are reversed so that are on the opposite side of the lady they are on in all the other tapestries. They are reclined, at ease listening to the music. All the animals in the forefront, too, seem to be listening. Where is the monkey? Is the music that bad? Again as in Smell the lion is nearly as tall as the servant. The lady stands with one hand touching the unicorn's horn, and the other holding up the pennant. 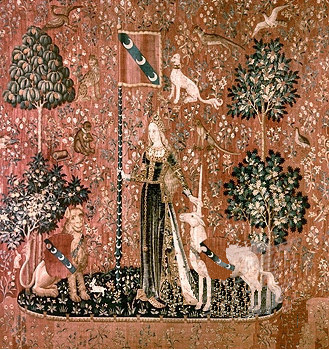 She is the only figure holding (touching) a pennant in this tapestry. I think the detail of this particular lady on Touch is the most realistic. No maidservant - she is not to be touched or to touch important things as the lady does. The lion sits to the side and looks on. It looks to me like the monkey sits with a what looks like a collar around his neck and seems to scratch himself. The unicorn looks too much like a pony-unicorn to me. The lady is seated, holding a mirror in her right hand. The unicorn kneels on the ground, with his front legs in the lady's lap, from which he gazes at his reflection in the mirror. The lion on the left is the only one holding a pennant. Again, the monkey is missing. This lady is very round faced, unlike any of the other ladies. And this is not a pony-sized unicorn like in Touch and is the most detailed of all the unicorns. The lion is deliberately shown looking away, as if he is not permitted to look in the mirror. Or perhaps he is looking off-scene at the monkey, who is doing something annoying the way naughty monkeys do. I think the theories about the meaning of the sixth tapestry, "To My Only Desire" are way overblown. Here is my theory. First, the translation is "sole" as in single, not "soul". So forget the religious theories about renouncing whatever. 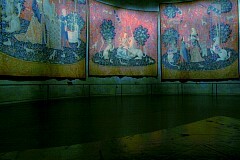 The six tapestries were a set. The lady depicted is young, most likely just reaching marrying age. 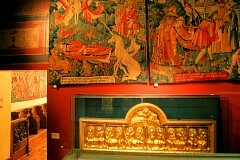 So the nobleman Jean Le Viste presents his fiancee or young wife these decorations for their new abode. The first five tapestries show her that, wonderfully, all her senses shall be engaged in the fulfilled desires of her comfortable new life - music, wealth, delicacies, flowers, a servant, nature and land, jewelry and other tactile items, honor and respect. 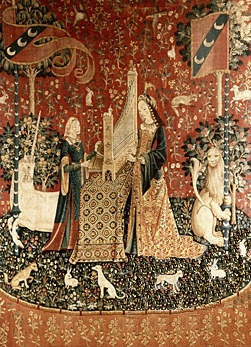 The sixth tapestry is simply a personal testament from Jean Le Viste to her - of all the depicted pleasures and desires for HER, SHE is HIS single and only desire. The title says it all. 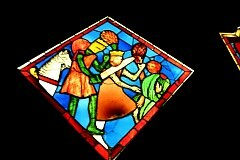 Some more beautiful remnants of stained glass windows. These have to be medieval dinnerware - plates. 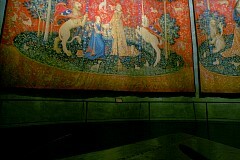 In another part of the Cluny hang a tapestries from a later era than The Lady and the Unicorn. Now outside the museum, I think this is an old Peugeot.